Everyone has favorite collectible toys that evoke fond memories of childhood. From Fisher Price Little People to Thomas the Tank Engines, most everyone saves at least a few toys. What do you have safely tucked away in your attic? What Makes a Toy Collectible? 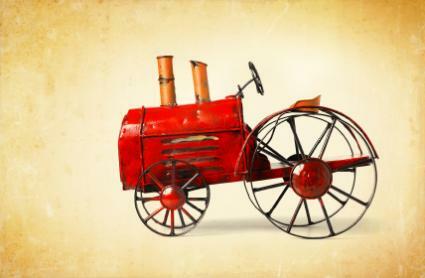 A toy doesn't have to be an antique to be collectible, although many collectible toys are indeed antiques. The term antique is used for items that are at least 100 years old and vintage is used for items more than 25 years old. Toys are collectible simply because many people want them. Perhaps they remind you of your childhood, they are unique in some way, or maybe they are rare. Whatever the reason, toys are a favorite among collectors from all walks of life. Toys really haven't changed much through the ages. Children have played with dolls, marbles, and games for centuries and, not surprisingly, these are often the items most eagerly sought by collectors. Action figures, like most collectible toys, are worth the most if they are in the original box and have never been played with. There are many types of dolls available for the collector, from antique to contemporary. Antique dolls come in many types, sizes, and materials. Wax or wax over dolls are made either from wax poured into a mold or melted wax poured over papier mache. They have been made since the late 1700s and are very delicate. China dolls were made between 1840 and 1880. They have glazed china heads and are usually identified by their hairstyle. Parian dolls are similar to china and were made during the same time, but the heads are left unglazed. Bisque dolls were produced in France and Germany from the 1840s until after World War I.
French bebes were an innovation because they were the first dolls to be made that looked like children. These dolls were quite expensive to purchase new when they were introduced into the market, and remain today some of the most expensive dolls to collect. Dolly-faced dolls were made in the 1890s and were cheap copies of the French bebe doll. Popular manufacturers of antique dolls included Jumeau, Bru, Steiner, Kestner, and Simon and Halbig. Dolls in their original clothing with all the accessories and in the original packaging are usually more valuable than a doll on its own. Dollhouses are another fun collectible that can be either antique or contemporary. Antique doll houses often have beautiful lithography and details. Many contemporary collectible dollhouses are not made for play at all but are replicas of beautiful Victorian houses complete with painstakingly detailed furniture made to scale. Children have been playing games since the beginning of time. Collectors may collect complete game sets or only the colorful game boards. The latter are often used as wall decor because of their unique designs. Antique game manufacturers include W. & S.B. Ives Company (1850s), Milton Bradley, McLoughlin Brothers (1860s), and Parker Brothers (1880s). Trains come in a variety of sizes and one is not necessarily more valuable than the other. Many collectors like to enjoy their hobby with others. Whatever type of toy you like to collect; odds are there is a club for it. A benefit to belonging to a collector club is that you can find out how to care for your chosen collectible as well as knowing what the values of your toys are. Check out your local newspaper, phone book, public library or town hall bulletin boards for collector clubs near you. It's best to buy the items you love rather than choosing items for investment value. Collectibles come and go; the Beanie Babies craze in the 1980s is a good example. People paid hundreds of dollars for Beanie Babies believing that they would continue to go up in value. Many of these collectables can be found in your local thrift shop today for pennies. Collecting what you love means that the items will always be valuable to you.